It’s surprisingly hard to get a good photo of yogurt. That’s the third batch of drained yogurt I’ve made this week. I can’t stop myself. It’s so easy and it’s so crazy good. I take three or four coffee filters, wet them (it makes them more pliable), squeeze out the extra water and line the bottom and sides of a small colander with it. 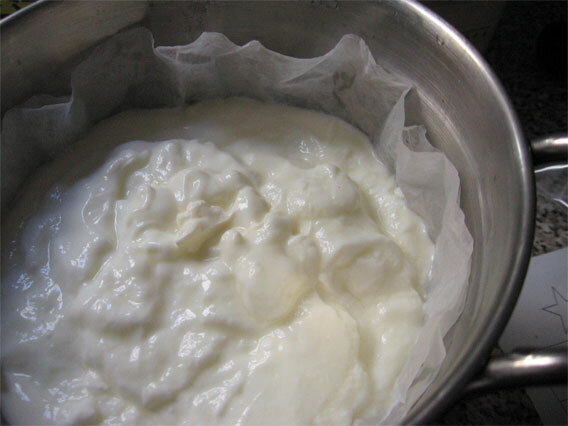 Pour the yogurt in, layer one last filter on top so it doesn’t dry out, then stick a bowl under the colander to catch the drips. A couple hours (or overnight) in the fridge and it’s turned into something fantastic. You can do the same with any yogurt, although I’ve read nonfat yogurt can end up a little sour. I use Brown Cow’s whole milk yogurt (because I prefer whole milk yogurts and Whole Foods currently has a coupon for $1 off Brown Cow.) I also think it tastes better than the store-bought Greek yogurts which can sometimes be a little too heavy and even a little pasty-tasting. So far, I’ve used it as a substitute for sour cream in a couple of recipes—and, of course, just eaten it from the container with some honey or jam—but my favorite use so far as been the cucumber and yogurt salad called tzatziki (in Greece) or cacik (in Turkey). [If you include the optional oil and vinegar, it’s tzatziki; without them, it’s cacik.] Toss the cucumber with a good amount of salt and let sit in a colander for 30 minutes. Rinse and either drain on paper towels or squeeze out excess water by hand. Combine all remaining ingredients and season to taste. Serves 4-6. Wanna try something interesting? Use a veggie peeler to cut long, thin strips of cucumber instead of chopping or grating, then finish preparing as directed. It makes an interesting pasta-like alternative and a great bed for grilled fish. Damn, that does sound good — although in a 610 ft² apartment, we’re not so much with the grilling of fish around here. Now I’ll have to think of something else to eat it with. Of course, the last batch of tzatziki was eaten straight from the container with a piece of flatbread (and when that ran out, a spoon). We went to a party for Dawn’s friend Constantine Mountrakis this weekend. I don’t have to tell you about the kiddie-pool-sized bowl of tzatziki that was available. No grilled fish? ACK! I have also found poaching to be an option, and it’s a little less smelly – put a firm whitefish filet on a piece of plastic wrap with a slice of lemon, olive oil, and a couple fresh basil leaves and wrap it like an egg roll but tighter, and put it in a pan of lightly-boiling water, and cover the pan until the fish cooked through. Light flavor and almost no stink. Sounds amazing and looks good too. A nice fish could be the way to go for a nice main with such a good side. My husband and I were vegetarians for so many years that honestly, I’ve never really quite gotten the hang of cooking meat. I cook it now and then, but for the most part, meat is more like a condiment than the main event.